Boxcutters, Jigger, Citrus Juicer, Strainer, Collins Glass. Fill Collins Glass halfway with ice. 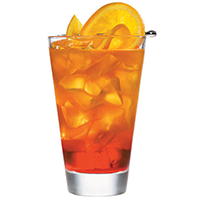 Pour in the Red Vermouth, Orange Juice, and Cranberry Juice. Pour Grenatine down the inside of the glass and let settle the bottom. Guarnish with an Orange Slice.